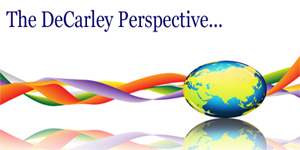 This commodity newsletter was emailed to DeCarley Trading clients on April 18th 2010. Stock market bulls have been handsomely rewarded in recent months as the markets have experienced a "tech bubble" style rally. The stunning gains have been made despite fragile market fundamentals, weak seasonal tendencies and a substantial "wall of worry". With the earning season underway, all eyes on are on corporate income statements. Unlike previous quarters in which investors were happy with earnings of any kind (even those attributed to cost reduction), the market wants to see improvements in revenue. While we are still early in the process, it appears as though the news has been positive. The question remains whether or not the numbers will be enough to support what appear to be frothy equity pricing. Ahead of earnings, stocks have run for six consecutive weeks to their highest level in 18 months. At the same time, the VIX (the CBOE's volatility index) has fallen to two-year lows. It is clear that the market has become complacent in the prospects of the economic recovery and the market's ability to continue higher as improvements develop. However, on the other side of the coin, many analysts are noting that stocks have dedicated the last 12 months to pricing in a robust global economic rebound and the latest data suggests only moderate improvements. Simply put, the market is well ahead of reality and unless the numbers pick up, the equity rally should be due for corrective trade. According to calculations done by Robert Schiller of Yale, the current earnings per share for the S&P 500 is 21.83 (based in inflation adjusted earnings from the previous 10 years). Historically, valuations above 20 have been unattractively high; also, most projections are calling for the 2010 EPS in the S&P 500 to be closer to 17. Accordingly, it is difficult to be a bull at lofty prices. In our last newsletter, we were bearish equities and didn't expect the rally to penetrate the 1150 area but we now know that 1150 was only the early stages of one of the largest rallies in history. Given the bearish fundamental arguments, we will stubbornly remain overall bearish. That said, our expectations are for a pullback rather than complete destruction of the markets. Friday's selling could have been the technical break the bears have been looking for, but we aren't convinced that the markets will go straight down. 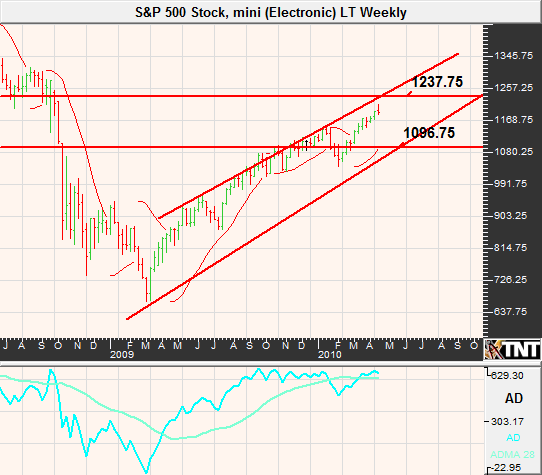 In fact, a weekly chart suggests that the S&P could see the mid 1230's before a large correction can take place that could be as deep as 1100 in the S&P 500. In early April, the benchmark 10-year note broke above a 4% yield for the first time since June of last year. However, strong demand for a boatload of government issued Treasuries were enough to force yields back below 4%, sending Treasury futures prices higher. The longer that Treasuries defy gravity, the more bearish analysts seem to get. Most believe that improvements in the economy and massive supply (the U.S. government is expected to issue another $2 trillion in debt in 2010) will force yields higher. One of the more aggressive forecasts, made by Morgan Stanley, believes that the 10-year note yield will rise from the current 3.8%ish to 4.35 by June and 5.5% by the end of the year. On the other hand, a handful of banks are looking for a stalled recovery that could send yields back to 3% by year-end. 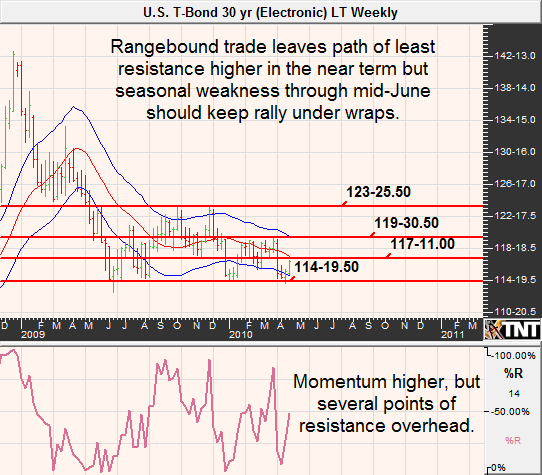 Seasonal tendencies should be a drag on pricing through mid-June, but that doesn't meant that Treasuries can't rally. 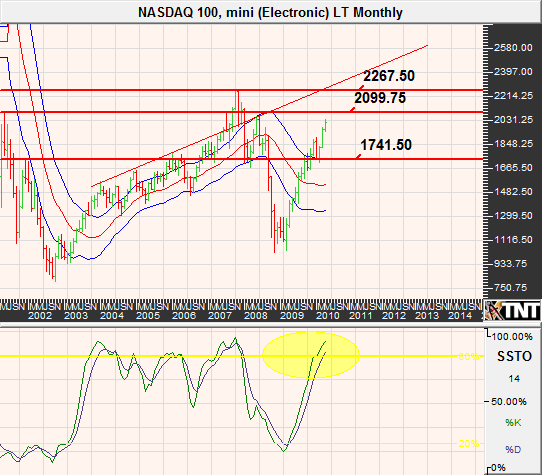 The direction of Treasuries will likely be highly dependent on action on Wall Street. If the stock market rally finally takes a breather, bonds and notes could get a significant boost; 120 isn't out of the question in the June 30-year bond and a retest of the 124's might even be possible on a complete meltdown in equities. However, we aren't anticipating the later event becoming reality. We like the idea of playing the short side of Treasuries on rallies, but caution that the chart is setting up for a large explosion in price. Agricultural commodities seem to be poised for higher prices going into the growing season given the strength of the economic recovery (which stocks have priced in but many commodities might not have). Also, if the U.S. dollar rally takes a breather it could open the window for more aggressive buying in commodities. On the flip side, commodities stand to suffer on news of central bank credit tightening. Australia, Canada and China are all expected to begin nudging their target rates higher and here in the U.S. the Fed will probably look to bump rates at the discount window in order to send a message to the markets that "extended period" doesn't mean forever. Earlier this month, the USDA increased its estimates for the 2009/2010 ending stocks from 1.799 to 1.899 billion bushels up from 1.673 billion the previous year. The news put temporary pressure on corn futures, but the reaction was short lived as the markets seemed to have the news priced in well before it was released. The revised ending stocks resulted in an estimated stocks to use ratio (the percentage of current annual demand that can be met by stocks on hand) of 15%, the highest since 2006. On the world market, expected ending stocks were revised lower but still at a comfortable 18% of annual use. Additionally, studies are suggesting that the cost of raising a corn crop in 2010 (midwest) is down considerably from the previous year and this could work against the bulls. Strictly looking at supply, it appears as though corn would have a hard time making any headway in a rally, but the spring and summer months can be a volatile time for the grains as weather concerns tend to trigger spikes in prices. 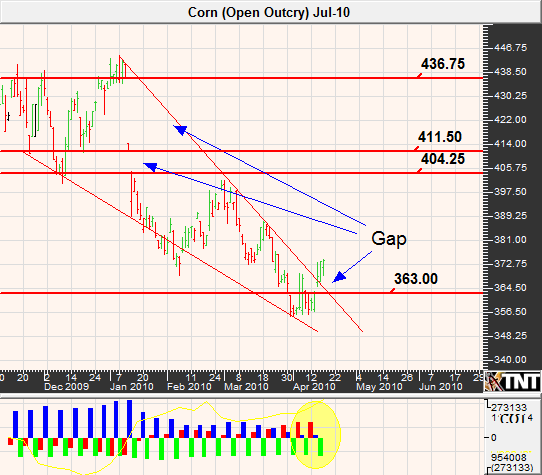 There are a lot of gaps on the corn chart, one below but most above. While we think that the best trade in the next few months will be from the long side, it seems likely that corn prices will stall near the mid-$3.80's and could fill a gap by trading down to $3.60 or even as low as $3.50 before a solid base is formed and a bigger rally is possible. Soybeans seem to offer more promise to the bulls than corn. Unlike corn, bean prices have made their way over the 50-day moving average and have closed above resistance set by the previous trading range. Also unlike corn, the USDA didn't make any revisions to the estimated 2009/2010 ending soybean stocks. Domestic ending stocks are expected to be 190 million bushels, which puts the expected stocks to use ratio at a skimpy 6%. Such tight supplies could exaggerate any weather concern throughout the growing season and leaves soybean prices open to substantial volatility. We feel that the shaky fundamentals and the large technical wedge in soybean prices favor an eventual breakout to the upside. 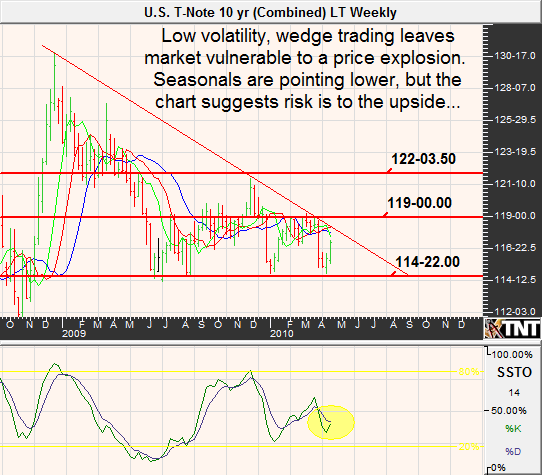 In the last newsletter, we noted support in July corn near $9.26 and a subsequent rally that could extend to $10.67ish. The process has played out much slower than we thought it might, but nonetheless we still feel like the overall target will be the same. 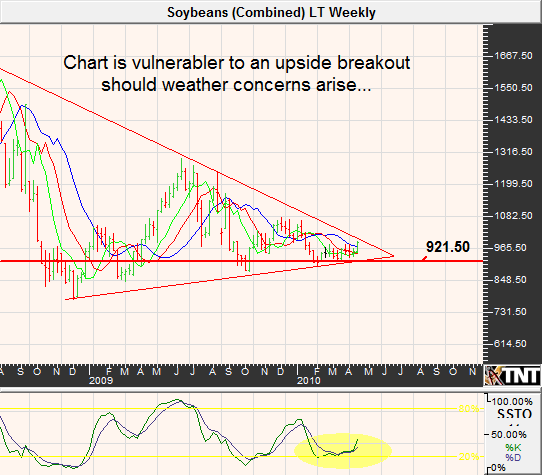 In the meantime, July beans are slightly overbought and could see a pullback to the $9.70 area before recovering. Many analysts and traders are questioning the driving force behind the recent crude oil rally. From a fundamental standpoint, there are some flaws. For instance, the U.S. department of energy announced that the surplus capacity for crude oil was 5.1 million barrels per day. This is much more comfortable than the 1.5 million in excess in 2008. Also, the run up in energy prices has been tied to the global economic recovery, and like stocks, might have overshot reality. Despite all of this, crude is a market that trends well and once the ball is rolling it can be hard to stop. 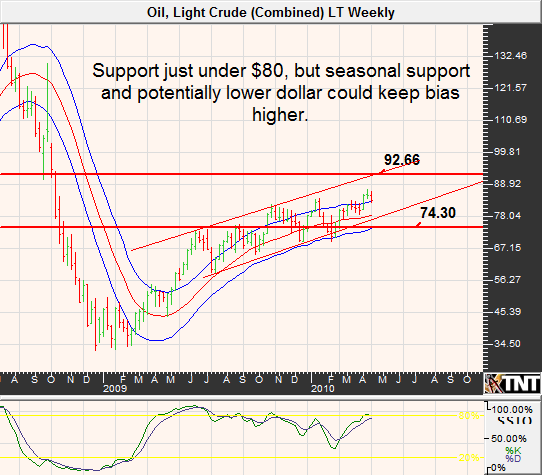 June crude oil futures are inclined to rally through mid-May, so we have to lean higher overall. That said, the chart is a bit suspect and we feel as though a pullback to retest $80 in the June contract will be necessary before prices begin to pick up steam once again; resistance, lies near $92. According to the World Gold Council, China's demand for gold amounts to 11% of world demand and this is expected to double in 10 years. However, with the global economic crisis either over or stabilized the demand for gold by the retail public has tarnished. The overall tendency for gold prices in April and May are weak but if the stock rally falters, gold will eventually be a direct beneficiary of funds looking for a "home" (although they have been awkwardly correlated). We don't necessarily agree with the premise of gold being a safe-haven, but others do and this would be a likely scenario. In the last newsletter we mentioned that the rally could see $1164 in the June contract. Prices actually saw the 1169 area before sellers came in. 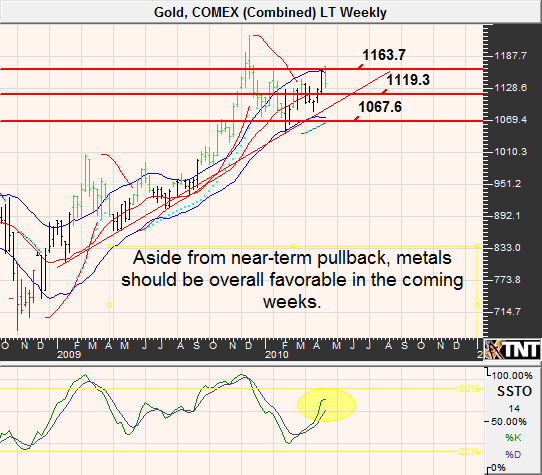 We wouldn't be surprised to see gold trade below $1100 again but it seems as though there could be continued buying. Earlier this year, the U.S. dollar benefited from the unwinding of a massive carry trade in which many traders were short the dollar with the intention of profiting from higher interest rates in other currencies. However, the bulk of the covering seems to be behind us and with dismal fundamentals backing each of the currencies traders are once again wondering which is "less bad". 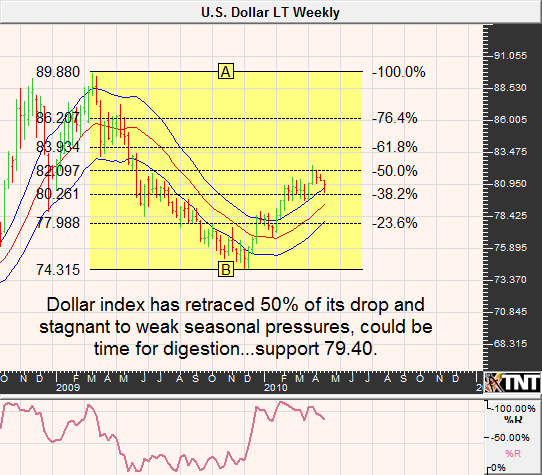 In the long run, we are in favor of the dollar but the market feels like the most likely scenario is ranging trading. The seasonal tendencies are marginally in favor of the Euro and we are headed into the "summer doldrums" which tends to have a negative impact on currency volume. We see potential for the June U.S. dollar index to rally to 82.50 and maybe even as high as 83.00 but don't see an immediate reason for prices to get much higher. In the meantime, support should be found near 79.40. Earlier this month we learned that the fourth quarter GDP in the Eurozone was .1%. The positive reading was nice, but puts the recovery in this region behind that of the U.S. and this along with Greece's difficulty in paying back debt justifies the Euro currency's inferiority to the dollar in recent months. Nonetheless, much of this news is already incorporated into pricing and the Eurozone region does maintain a more optimistic unemployment rate than that of the U.S. 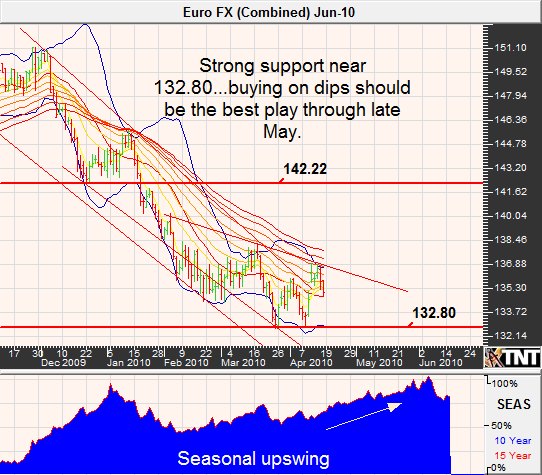 Similar to the dollar index, we are looking for relatively range bound trade in the Euro. The most recent round of selling should bring the June Euro back to 132.80 and if the move accelerates, 130.50 could be seen but we like the idea of buying "on the cheap". "Record high prices in sugar have never been able to sustain themselves in the long-term but the question is always how high can prices go before the plunge ensues? In 1980 prices peaked near 45 cents but was trading near 16 cents about 6 months later and within a year prices had declined to nearly 6 cents. Similarly, in 2006, sugar peaked near 20 cents but fell to under 10 cents within 8 months. Assuming that the current rally has seen its highs, it seems likely that the market will see 17 cents at some point in the near future. Although sugar prices appear to be in the process of retesting the recent lows, we feel as though the odds favor a moderate upswing from here. Sugar supply is still tight, but it doesn't appear to be the disaster levels that we have seen in the past. For instance, the world production surplus for the 2010/2011 season is expected to come in around 1 to 3 million tons as opposed to a deficit of 10 to 12 million last season. Also, India has increased its production forecasts by 2 million tons. 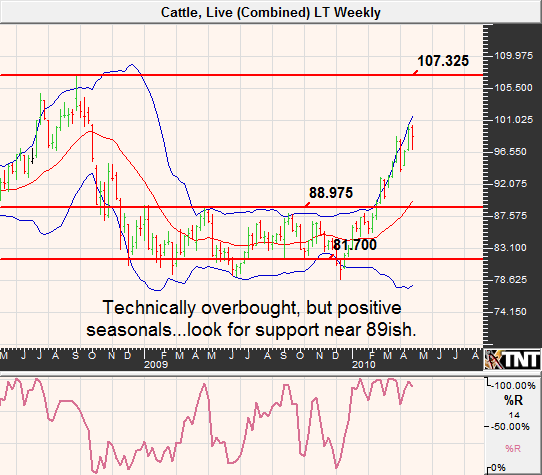 We feel as though the market has already priced in the improving fundamentals, but the fact that it has might help the bulls gain an edge should there be an indication of unfavorable harvest conditions or a miss on the estimates. 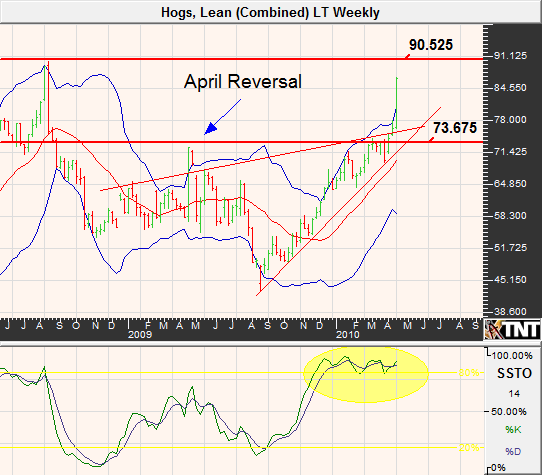 Coffee prices remain weak despite an impressive February/March rally. However, the dramatic selling seems to already account for a possible oversupply in arabica beans. This leaves the upcoming frost season in Brazil in the driver's seat. In other words, only a slight inclination of a potential freeze could send prices soaring higher. We admit that trying to be bullish coffee now is like trying to catch a falling knife. We are looking for prices to trade below $1.30 and maybe even as low as $1.25 but like the upside from there. Hog prices were so deeply discounted post-swine flu, that many producers were forced out of the business. After all, with market prices of the product below the cost of production it can be tough to run a profitable ranch. The reduction in producers eventually caught up with supply and have since forced hog futures miraculously higher. Along with bullish supply factors, consumers have nearly forgotten about swine flu and demand for pork has begun to return. February total port exports were up almost 1% vs. a year ago. The CFTC's commitment of traders data suggests that large speculators are heavily long, while small specs remain moderately short. The extreme long position held by large speculators must be reversed at some point, but it appears as though prices could defy gravity in the short-term. We feel like summer 2008 highs could be a target for large specs and small specs will buy to cover as the squeeze continues. Nevertheless, we like the short side of hogs near 90 cents. Both January and February beef exports were up 9% from a year ago and this has kept the bias in live cattle futures bullish. The charts are looking considerably overbought but late April and most of May tends to be a seasonally bullish time of year. A pullback in the near-term could see prices as low as 91.50, or even 89ish, but we feel like the overall upside target could be the 2008 summer highs near 107. Similar to the hog stats, small speculators are net short...and they are typically early. We like trying to be bulls from the noted support areas.